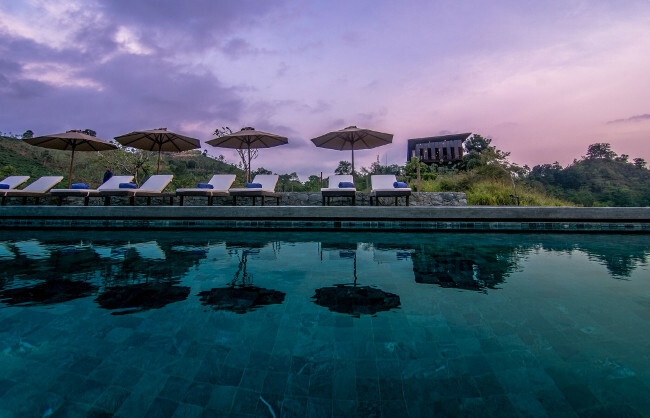 Santani is set in the lush landscapes of Sri Lanka’s hill country. It has been impressing visitors with its wellness programmes, minimalist architecture and beautiful location since opening last September. It was one of 2016’s most anticipated spa openings, both within Sri Lanka and across the high-end wellness industry in general. Why? Santani promised a new approach to wellness, billed as wellness 2.0 – in addition, it was a luxury property opening in Sri Lanka, a destination with increasing appeal for luxury travellers. The hotel was the brainchild of owner Vickum Nawagamuwage, who grew up in Sri Lanka before leaving to pursue his career overseas. Vickum has always understood the beauty of Sri Lanka, and when he started to think about opening a luxury wellness resort, it was the first place that sprung to mind. Over the years, Vickum had undertaken several wellness programs at internationally-renowned centres across the world, but thought there was scope for a new kind of resort. This was very much the driving force behind Santani. But what is wellness 2.0? It may be easier to discuss in terms of what it is not. It is not a one-size-fits-all destination catering only to those looking for a very strict and prescribed regimen. Neither is it a place that enforces a particular program on guests. Instead, it focuses on creating a completely personalised experience for each visitor, tailored completely to their needs and personal goals. “Wellness 2.0 is all about personalised and sustainable wellness. Most 1st generation wellness resorts are regimented and do not account for each guest’s practical realities. For example, most resorts will just serve you vegetarian food without any differentiation [as to whether you are usually vegetarian]. Another example is juice detox or yoga being the answer for all your wellness concerns. However at Santani, while we do provide all the above, they all form part of an integrated approach.” Vickum explains. Santani is the luxury spa and wellness destination that wellness devotees, first-timers and even those simply looking for a relaxing escape in Sri Lanka will love. Together Vickum and his General Manager Shane VonHagt have created one of the most exciting luxury destinations to open in recent years. Santani is very much a contemporary design-hotel. Built in what was previously a tea estate, it spans an area of over 48 acres, giving guests plenty of space to explore. The buildings are set in a relatively small area of that 48 acres, with the reception, guest villas, spa, pool and dining/social area no more than a few minutes walk from each other. Construction started in May 2015, and it opened in September 2016: Santani is one of the newest hotels on the island, yet also one of its most innovative and eco-friendly. Vickum was keen to incorporate an architectural design that would mean that the hotel could be cooled without the use of air-conditioning. This requirement guided his choice when he was looking for a suitable location for Santani. Down on Sri Lanka’s coast, the days and nights are too hot, making air-conditioning a necessity for any high-end resort. 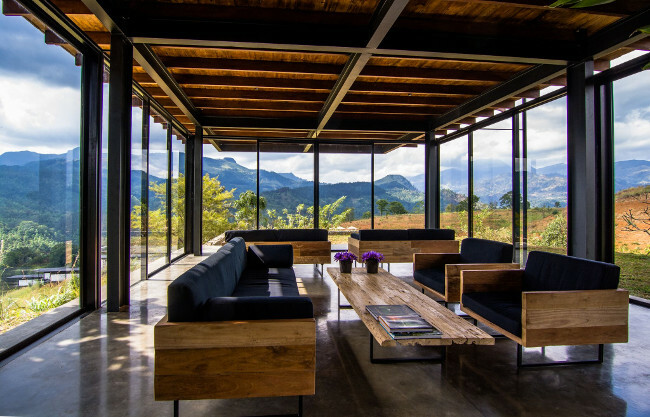 The hill country is much cooler, a fact that is maximised through Santani’s design: the villas are built on stilts on the side of the hill to ensure the air can circulate freely and stay as cool as possible. As air-conditioning generally accounts for 70% of most hotels’ energy usage, this forethought and consideration puts Santani in a strong position to back up its environmentally-friendly claims. In fact, it’s this level of thought that generally sets Santani apart, both as an eco-friendly retreat and as a wellness destination. Vickum sees the two as inextricably linked: for example, what’s the point in spending your days focusing on cleansing the body to fill guests’ lungs with re-circulated, recycled air as soon as they get back to their villas?